Every month, a group of bloggers gets together to post reviews and thoughts on a Christian science fiction and fantasy book. I used to participate in these tours a lot many years ago. I had to discontinue my participation due to scheduling crunches. This month, though, the tour is taking a look at Numb. I have to be honest, this has me really excited. I’ve wanted to have one of my books be featured on the tour since I joined all those years ago. Now normally, I would start a tour with a review of the book. Well…I wrote this one, so it doesn’t seem like a great idea for me to review my own book. Instead, I thought I would tell you Numb‘s origin story. The whole thing started back in 2005 or so. I had this idea for an urban fantasy book series. Basically, the books would be set in a world where fantasy creatures and normal humans lived side-by-side. Each story would be about an elf private detective who served as a sort of bridge between the two worlds, using magic and guns to bring criminals to justice. Sounds cool, right? Well, I decided to test the waters by writing a short story about my PI elf. I polished it up and sent it off to a magazine. The editors of the magazine sent back a very polite but firm rejection letter, noting that my idea had been done before by someone else. Well, I wasn’t quite done with it yet, so I tweaked and twisted the ideas until I came up with a short story I entitled “Irruption.” Yes, that’s a word and yes, that’s the word I was looking for. I submitted the story to an on-line magazine called Dragons, Knights, and Angels, which featured Christian science fiction and fantasy. I sold them the story in 2007. Unfortunately, the magazine has since gone off-line. But you can still read the story. Check it out, if you’re so inclined. Shortly after I submitted “Irruption” to Dragons, Knights, and Angels, they announced that they were going to hold a short story contest they called “Dragon, Knight, Angel.” Basically the instructions were to take the three elements of their name and write a story that incorporated all three. I don’t remember all of the details, but there were two things included in the announcement. First of all, they didn’t want dozens of stories that retold the legend of St. George and the Dragon. And second, they didn’t just want fantasy stories. They wanted science fiction stories too. Well, that got my mind whirring. I imagined a space freighter captain (my knight) hunting for a mythical alien artifact called the Dragon’s Heart. And along the way, he would pick up a dirty urchin of a girl (think Newt from “Aliens”). I was excited and I started writing. But as I worked, I realized that the story I was trying to tell wouldn’t fit within the maximum word count of the contest. It felt more and more like a novel. And, as luck would have it, I had just learned about this thing called National Novel Writing Month. I decided that I would scrap what I had written thus far and turn it into a NaNoWriMo project. And the story went pretty well, for the most part. I added in some great secondary characters: a cantankerous cybernetic engineer, a quiet hacker-type, a good-natured and beautiful pilot (I think) who had a thing for the captain even though he was married. They had a number of adventures that ranged throughout the galaxy. But then, by the end of November, I was thoroughly sick of the characters and the story. All of them, except for the pilot, turned out to be horrible human beings. And the pilot wound up either dead, severely injured, or a murderer. Even though I reached the required 50,000 words and “won” NaNoWriMo that year, I only made it halfway through the story and I was so disgusted by it that I just stopped writing. But one interesting thing came out of writing that book: two intergalactic governments that were in a constant state of war with each other, one called the Praesidium and the other called the Ministrix, a corrupt version of the church with sinister leaders, massive warships, and desire to force everyone to their own viewpoint. I think a lot of what went into the Ministrix was influenced by Gregory Boyd’s The Myth of a Christian Nation . If you want to read a really provocative book about the intersection of Christianity and politics, check it out. Anyway, when Thanksgiving rolled around, my wife and I went to my family celebration. That was before any of my siblings had kids, so we did what we usually did. We went to see a movie. 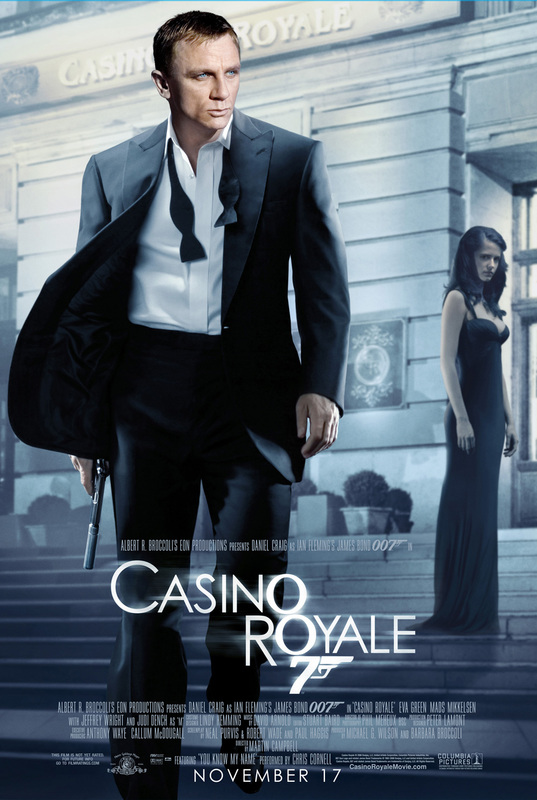 And we decided to check out Casino Royale, the movie that rebooted the James Bond franchise with Daniel Craig. I had read a bunch of movie reviews before we went, and they all basically said the same thing: Daniel Craig’s Bond was not the smooth, suave, sophisticated spy we were used to. His Bond was more a blunt instrument, the kind of guy you send in when you want someone dead and don’t care about subtlety. More brute than gentleman. I remember one scene were this became very clear for me. Bond shares a drink with a woman named Vesper. She says good night and starts up to her room in the titular casino. Bond follows her up, and good thing, too. It turns out that Vesper was attacked along the way. Bond and the assassin wind up fighting in the stairwell, eventually tumbling to the bottom. Bond then strangles Vesper’s attacker while she watches. Once the man is dead, Bond slumps against the stairs. Vesper collapses onto him, sobbing. And here’s the part that I remember clear as day: Bond doesn’t react. He just sits there, his face a blank. Then, after a second, he mechanically put his arm around Vesper, but his facial expression doesn’t change. It’s almost like he isn’t feeling any pain or emotions. And I remember sitting in the movie theater and thinking, The Ministrix needs someone like that. The rest of the story kind of fell together. If there’s an assassin who doesn’t feel emotions or pain, what would knock him for a loop? How about seeing a woman who stirs up emotions in him for the first time ever? And what if she’s his next target? What would he do? And that, ladies and gentlemen, is where the story of Numb came from. Come back tomorrow and I’ll tell you another story, this time about Numb‘s cover. See you then! I love this book! Hope the tour is great, John! I enjoyed reading your roundabout route in finding your story. Gives me some hope for my abandoned NaNoWriMos! Thanks for sharing! Love this!!! And I confess, I really love the new Bond movies, so it was neat to hear how Casino Royale inspired this story. Thanks for taking the time to share! Always fascinating to see how other writers ‘find’ their stories… especially as I do all my first drafts in NaNoWriMo, it’s reassuring to know something good can be salvaged from that!